As spring approaches many valley residents are putting together plans for keeping their gardens and lawns free of pests. 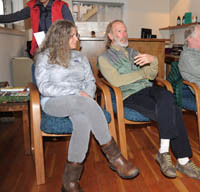 In anticipation of that, the nonprofit Environmental Resource Center in Ketchum this week announced its merger with the Pesticide Action Network of Blaine County. Now, the ERC is providing information on alternatives to chemical spraying. Ten supporters and board members gathered at a press conference at the ERC office Monday to celebrate the merger. Kathryn Goldman, campaign director for the Pesticide Action Network, said there is a “huge need” for education and outreach about the harmful effects of chemical fertilizers and pesticides. The Pesticide Action Network is a local citizens’ coalition formed in 2011 to advocate for changes in chemical pesticides use in the places where kids play, including schools and parks. Goldman worked to implement the first integrated municipal weed-management program in Idaho, promoting the use of animals, bugs and non-chemical treatments to lawns and gardens. Two years ago, valley residents Brian Ross and Susan Reinstein donated $100,000 to PAN to pay for goat herds to graze noxious weeds along the bike path for three summers. Goldman presented a five-point questionnaire for landscaping companies, in order to assess whether they would be likely to explore the use of non-chemical pesticides. The list includes requesting an on-site meeting and soil test evaluation, followed by a determination of what types of fertilizers and pesticides the company uses. Goldman said natural compost would be favorable to “quick release” fertilizers and using natural pesticides, such as corn gluten, would be preferable to using chemicals. “It’s about helping your lawn out-compete the weeds,” she said. Goldman said dandelions and other flowers can be beneficial for insects, which are needed for pollination. “Getting rid of all your dandelions is a purely aesthetic choice,” she said. Blaine County and the Wood River Land Trust will host a workshop at the Sawtooth Botanical Garden south of Ketchum on Thursday, April 10, from 9-11:30 a.m. for homeowners, property managers and landscapers interested in learning about weed-control alternatives. For more details on non-chemical weed control management, go to Goldman’s Blaine County Guide to Safer Weed Control at www.pesticideactionnetwork.net.